n a not-so-bad October night in Portland a couple hundred folks of varying comport gathered at the Guild Theater to travel back in time for an oddly modern treat. The event was a one-evening-only screening of FW Murnau's 1922 classic, "Nosferatu," with an original score performed by Boston's appropriately named Devil Music Ensemble. Cadaverous count: The story of the original cinematic vampire. It's hard to explain how an 83-year-old movie accompanied by an antiquated method of cinematic sound delivery could be so thrilling. But on this night, memories of whatever ridiculous pleasures one may have garnered from "Revenge of the Sith" or "War of the Worlds" were completely washed clean by something so old it was new again. 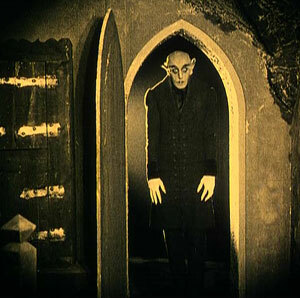 "Nosferatu" tells the story of the original cinematic vampire, Count Orlock, in the sympathetic style of German Expressionistic cinema. The concept is simple: a crazy old firebrand real-estate agent, Knock, realizes there's scads of money to be had by selling the mysterious count a desolate house in his own neighborhood. Though the NIMBY aesthetic had already been in play since time immemorial, a pile of ducats proves lure enough to bring the cadaverous count, whom death follows like an old friend, in amongst the fold. 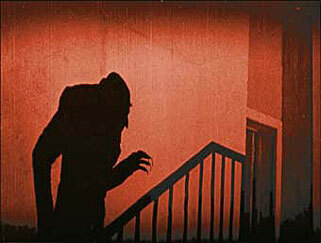 Though some of the acting and a few of the scenes had the audience inappropriately laughing (Ill admit shots of Nosferatu hotfooting it through deserted German streets with his coffin under his arm  a malevolent minstrel with a violin case of Doom  were unintentionally comical), Murnau amply demonstrates the old-fashioned skills of the terror monger. Shadowy shots of the simply uncanny  long shadows, the rat-like titular character and a fully shrouded horse-drawn carriage stood out. Old-fashioned skills: delivering at all the right moments. The Devil Music Ensemble knew what to do to sell this movie to a modern audience, while paying apt homage to its classical motifs. The ensemble was composed of Brendon Wood on electric and lap steel guitar, banjo, accordion and synthesizer; Jonah Rapino on electric violin and vibraphone; and Tim Nylander on drums and percussion. The instrumentation for the most part was of relatively modern origin, but the compositions straddled the line nicely, conjuring a type of Balkan classical music with psychedelic rock leanings. As one might think, the silent-film proceedings needed a lift to keep jaded viewers engaged; the title cards were propelled with a driving beat and loop-centric violin charts. The volume was a few notches below rock-concert level but for the most part served its purpose spectacularly. The ensemble even resorted on occasion to a current trope of horror-movie soundtracks, delivering chest-thumping jolts of high anxiety at all the right moments. All performers stood out at one point or another. Rapino switched from possessed violin flailing to ominous vibraphone figures with ease, relying on a harmonica-holder-styled contraption to keep his violin always below his chin  even as he pounded with his mallets. When not urging the pace on with his trap kit, Nylander created truly eerie effects by bowing his cymbals, a trick I'd never seen (and probably never heard) before. Finally, Wood proved a master of twisting Fender reverb to ominous ends, frequently synching up with Rapino's violin figures for compelling motifs that brilliantly directed emotions. 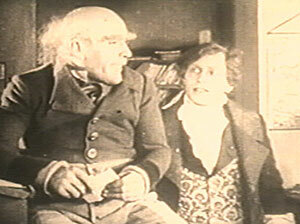 Singular experience: reinvigorating Murnau's moody masterpiece. The Devil Music Ensemble's original score, excellent performance and canny manipulation of contemporary sounds and effects reinvigorated Murnau's moody masterpiece, creating a singular experience that was as educational as it was exhilarating. The NW Film Studies Center is to be congratulated for coordinating this night of magic. The Devil Music Ensemble rightfully earned a sustained round of applause that hopefully eased the pain of its van breakdown in Los Banos, Calif., just prior to the Portland show.